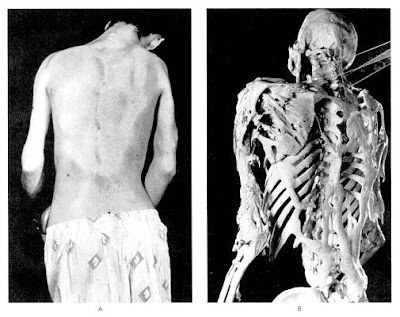 Fibrodysplasia ossificans progressiva is a rare disease of the connective tissue. A mutation of the body's repair mechanism causes fibrous tissue (including muscle, tendon, and ligament) to be ossified, or turned to bone, when damaged. Surgical removal of the extra bone growths has been shown to cause the body to "repair" the affected area with more bone. FOP is considered a genetic disease because the bone growth progresses from the top downward, just as bones grow in fetuses. A child with FOP will typically develop bones starting at the neck, then on the shoulders, arms, chest area and finally on the feet. Since the 1800s there have been references in medicine describing people who apparently "turned to stone"; some of these cases may be attributable to FOP. The most well-known FOP case is that of Harry Eastlack (1933–1973). 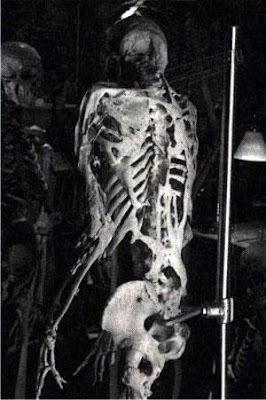 His condition began to develop at the age of ten and, by the time of his death from pneumonia in November 1973, six days before his 40th birthday, his body had completely ossified, leaving him able to move only his lips.